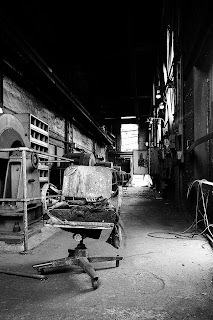 For those who remember the first and second posts in this little series, I present the "final" installment of my dissertation fragments (just in time for the new year). 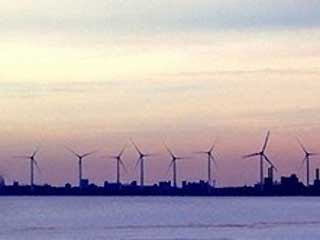 The first post, "Two False Starts and an Abstract" saw me attempting to think through the idea of horizons as a way for me to make connections between texts and humans. The second post, "Horizons of History" was the opening to the lecture I gave at Wake Forest in late November. Now, I present you all with the fruits of my long labor: The Dissertation Prospectus. I've felt reluctant to post it over the past few days -- it was provisionally approved (with necessary modifications) the day before Christmas, so I'm only just now re-reading it. Part of my reluctance to post it was, I think, my own discomfort with the prospectus genre. First of all, it is a genre that is made to be changed, so to speak -- everyone I've spoken to has said that their prospectus differed wildly from their final product. I would imagine the same will hold for me (particularly given how little I know Saints Lives at present), and there's a small part of me that would rather this early ambition-filled version of what I want to do gather dust silently, rather than continue to speak when its successor is a work in its own right. Further, it's hardly a perfected document. I think the major flaw in it is the terribly detached tone: then again, the prospectus seems a quite artificial writing project, if a necessary one. What I feel I've accomplished in this version is a coherent narration of my project -- in the end, I suppose, what one ought to have accomplished by writing it. I also think I've been forced to clarify my thinking, fit it into specific work that's going on in the field right now, and make it my own enough to hold weight. That said, there are a few flaws going in. First of all -- there is no extended bibliography. I am working on that -- though I have one, it's not exactly typed up at present. Hopefully I'll get there, and when I do, I'll post it here. Secondly, and perhaps more importantly: I feel like I've lost a lot of the dialogue I was trying to establish with Latour, Deleuze and Guattari, etc. I think that's necessary -- I need to explore the texts in a way that allows them to speak first and fully, even if I have a critical or theoretical "hunch" that involves Latour, etc. In short: I have to let the Anglo-Saxon texts dictate the way in which I use theory, and not vice-versa. That seems obvious, and indeed it IS obvious. However, I wanted to articulate it here: most importantly, because it's something I struggle with in my work, in no small part due to my penchant for the philosophical and the conceptual. Thirdly -- and this one is the really important bit -- I'm missing an entire chapter or so. It's the one I'm going to write on Beowulf, which will engage the questions I began raising in the second of the Fragments posts. The reason I did not write it up as a chapter yet -- and the reason I'm still not sure it will be a proper "chapter" -- is that I think I want Beowulf to perform a kind of a linking function. That is to say, I want Beowulf to be present in my dissertation in each of the chapters. I don't know that that will work -- which is, of course, why I need to write up the summary as a nominal "Chapter V" to the dissertation and let it go at that. At any rate, here it is: The Horizons of History: Writing (and Rewriting) Anglo-Saxon Collectivities in the Middle Ages. Thoughts, questions, comments, bibliographical additions are all welcome and indeed sorely needed. In the wake of the theories of narrative expounded upon in the 1980s by Hayden White and Paul Ricoeur, the approach taken by medieval studies vis a vis the study of early “historical texts” has benefited greatly from the new ways of thinking through the relationship between narrative convention and the functions of history in society. Monika Otter, for example, has used the relationship between fiction and history in the twelfth century to explore what she (following Ricoeur) has termed the referentiality of medieval Latin historical texts, or to put it plainly, the degree to which “fictionality, while not embraced as it is in vernacular romance, becomes a playful and (and sometimes alarming) possibility in Latin historical writing.” In the introduction to their 2006 edited volume entitled Narrative and History in the Early Medieval West, Elizabeth Tyler and Ross Balzaretti draw on the narrative theory of White to argue for literary practice not as a way “to look through form to facts” but rather as a way “in which the form of the text itself becomes a way into our understanding the past,” and thus enable “literary and historical methodologies [to] meet as equal partners.” The result of an interest in the ways in which form and content merge in the historical texts of the medieval past raises a number of questions, not least of which is “if early medieval historical writings were representations of the past made for present purposes,” how were these representations made, who made them, and what effect or influence did they have in the formation of early medieval identity? Further: By whom were they used, and to what purpose? Simultaneously, postcolonial thinking about the status of the nation in the formation of “modernity” has begun to question the conventions with which we approach the medieval past. Although some early theorists of the “nation” place its inception in the eighteenth or nineteenth century, more recent critics have argued for an earlier date for the beginnings of nation-building, with the most far-reaching of these looking to Anglo-Saxon England for the beginnings, in protonationalism, of what would become the modern English nation-state. Adrian Hastings’ assertion of vernacularity as a key component in the beginnings of nationalist sentiment has found eager adherents in Anglo-Saxon studies, which, we are often reminded, boasts the first vernacular translation of the Bible. Kathleen Davis’ influential work on the preface to the Pastoral Care emphasizes the rhetorical strategies of the text, which far from describing the world “as it truly was” was engaging in its own “nation-building” technique, attempting to set up a relationship between past and present which would allow for the continued growth of the political influence of the Angelcynn. My dissertation will explore the ways in which historical literature, broadly defined to include chronicles, world-histories and saints’ lives, functions in the construction of collective identities in the Anglo-Saxon period. My specific interest is in texts that were inherited from – or passed on to – cultures outside Anglo-Saxon England. By examining texts that were initially written by cultures predating the Anglo-Saxons, as well as texts which originated in Anglo-Saxon England but were passed on to later cultures, I will explore the ways in which these texts not only provided materials and models on which the Anglo-Saxons could base their own literary culture, but were themselves altered in the process of translation and transmittal. The texts I will examine are intricately linked to the process of nation building outlined by Davis, and though I am not as invested in the identification of protonationalistic tendencies in the texts, I will be focusing on the ways in which the nation-building process left its mark on the texts which were used as instruments for the imagining of ethnic and national identity. The “Alfredian Translation Program” in Anglo-Saxon England offers a particularly complicated view of translation as it relates to the issues of narrative history, national history, and time. Instituted during the reign of Alfred the Great in the late ninth century, the series of translations includes Gregory the Great’s Pastoral Care and Dialogues, Boethius’ The Consolations of Philosophy, Saint Augustine’s Soliloquies, the Venerable Bede’s Historia Ecclesiastica, a prose version of the Psalms, and – my interest in this paper – a translation of Paulus Orosius’ Historiarum Adversum Paganos Libri VII. Despite the sustained critical consideration of the prefaces to the Alfredian translations, however, the texts themselves – books described in the preface to the Pastoral Care as ‏‏ða ðe niebeðearfosta sien eallum monnum to wiotonne (“those which are most needful for all men to know”) are rarely the subject of much critical scrutiny, except where they diverge from their source texts in culturally significant ways. That the prefaces – the locus of “originality” in the works in the sense of forming a clear boundary between the Latin and the Old English – have undergone such sustained critical inquiry to the neglect of the works they come before is significant to the study of the Alfredian program. In her recent work on the Anglo-Saxon Chronicle, Alice Sheppard notes the specifically pedagogical aims of the texts, making the assertion that “they teach their readers what ‘makes’ and Anglo-Saxon and what defines Anglo-Saxon kings and kingdoms.” In thinking through the ramifications of this kind of a “writing of an Anglo-Saxon identity and the creation of a people who are known as the Angelcynn,” Sheppard’s main interest is in the narratives of kingship which are found throughout the various MSs, and for the most part, she limits her considerations to specific narratives in each MS. My interest, in choosing the Winchester, Canterbury and Peterborough MSs is to examine the ways in which narrative as a whole changes across the period during which the greater “Anglo-Saxon Chronicle” was being composed. The motion forward in time from the early Winchester MS to the post-Conquest Peterborough MS suggests what Hayden White has identified as a major difference between annalists and chroniclers, in which “annals represent historical reality as if real events did not display the form of a story, [while] the chronicler represents it as if real events appeared to human consciousness in the form of unfinished stories.” Working with ideas of narrativity, I wish to demonstrate that the alliances (over time) of different generic materials (including Saints Lives and later chronicle literature) had a profound effect on the composition of the later MSs of the Chronicle, suggesting that in the presentation of the Anglo-Saxon Chronicle as we see it in the most recent edition (by Swanton) is perhaps more telling than we think. The Anglo-Saxon Chronicle itself forms a collectivity of materials that differ in not merely their genre but also their composition, in that the representation of the Angelcynn that the work as a whole gives is very much influenced by the composite structure in which it is articulated. In writing his Lives of the Saints, Ælfric translates a number of hagiographic texts out of Latin, emphasizing in his preface not only his fidelity to the original but also issuing a warning that any copyists are not to alter the texts in question when they are further copied down. Among his chosen saints are not only traditional saints of Late Antique origin, but saints of England: both the saints and the cults of their veneration originated in the British isles. In the Anglo-Saxon tradition of the cult of certain saints, the ground on which the saints died (usually through their martyrdom) maintains a certain connection with their holiness: it often is capable of curing illness or disability. Examples of this from the Latin tradition include that of Saint Maur, and Saint Martin, among others. Most often this is through the presence of their relics, and churches or shrines are built in the place at which the saint perished. In the case of Saint Æðeldryð, the body of saint itself becomes the conduit and locus of miracles—further, the fact of its incorruptibility becomes a point of connection for religious belief through time, a proof preserved from before the time Bede wrote of it, git oð ‏þisne dæg (yet until this day). Saint Alban, too, becomes a point of gathering for pre- and post-persecution Christianity in the area of England: the place of his interment connects Christians across time, both before and after the reign of Diocletian (the emperor whom Ælfric cites as the perpetrator of the persecutions) as well as after the re-institution of Christianity by Augustine after it had once again fallen away. Æðeldryð and Alban suggest a connection of faith across time which inheres in the body of the saint. Saint Swiðun, the last of the trio of Anglo-Saxon saints I will examine, represents a kind of special case. Although his body is interred in the cathedral at Winchester, his vita proper is forgotten by the time of its inscription into Ælfric’s work and there is no body featured in the text. The fact of Swiðun’s existence is known only in miracles, and it appears throughout the text that there is a certain degree to which Swiðun’s sanctity is constituted not by the preservation of his earthly body, but by the works done through him in the world. Swiðun, termed in the text se‏þe nu niwan com (he who newly came), breaks down traditional ways of understanding the sanctity of saints in England, and in so doing, suggests a different model for connection with them. By looking at these three saints of England, I will argue that the community formed through them extends in time not only in their stories and in Anglo-Saxon England, but moreover with the stories of other saints in Ælfric’s Lives. Edward the Confessor, the last king of the line of Cerdic and so of the “Anglo-Saxons” proper (succeeded only by the Harald Godwinson before the “Norman” conquest), occupies a distinctive role in the history of Anglo-Saxon England. A “holy” king (not unlike the earlier King Alfred, whose vita was written by Asser in the tenth century), Edward’s function as regards “England” – both pre and post conquest – changed considerably through time. In her 1988 dissertation (unpublished), Martha Blalock focuses on what she calls the “legend” of Edward – literally, a reading of his life. She separates the historical materials from the hagiographic materials in so doing – classifying such works as the “Anglo-Saxon” Chronicles and the chronicles of Florence of Worcester in the former category and the various Latin and vernacular lives of Edward in the latter. In her analysis of the lives she suggests that “his legend can best be understood as a body of “accurate” or “inaccurate” historical facts which has been made to conform to saintly models” 13; thus, in assessing the hagiographical material, Blalock finds that the later, vernacular works show the influence of the “new historicity” she argues characterize the twelfth century renaissance, as opposed to the Latin lives, which are more traditional in form. In re-examining the lives of Edward the Confessor, I will argue that in order to understand the interaction between genres in the lives which are composed about him, scholars must turn to earlier models of “saintly” kings, and open the scholarship to the possibility that hagiography also – and at an earlier date – influenced the recording of history in Anglo-Saxon England, most particularly in the portrayals of Kings Alfred, Oswald, Edmund and Edgar. The saintly life of Edward the Confessor might then be best understood as a reading of the historical text already molded into the traditions of hagiography at the time of its inscription; the result is a composite image of a king whose power waxes and wanes with his holiness. Hayden White, The Content of the Form (Baltimore: Johns Hopkins University Press, 1990). Paul Ricoeur, Time and Narrative (vols. 1 & 3) (Chicago: University of Chicago Press, 1990). Monika Otter, Inventiones (Chapel Hill: University of North Carolina Press, 1996) 19. Elizabeth Tyler and Ross Balzaretti, eds. Narrative and History in the Early Medieval West, (Turnhout: Brepols, 2006) 7. Yitzhak Hen and Matthew Innes, eds. The Uses of the Past in the Early Middle Ages (Cambridge: Cambridge University Press, 2000) 1. Cf. Benedict Anderson, Imagined Communities (London: Verso, 1991); Eric Hobsbawm, Nations and Nationalism Since 1780 (Cambridge: Cambridge University Press, 1992). Cf. Adrian Hastings, The Construction of Nationhood (Cambridge: Cambridge University Press, 1997). Hastings’ (extremely western) examination of nationalism places a great deal of emphasis on the translation of the Bible as a step on the (all too teleological notion of) the road to nationhood. e.g., Davis. See also Nicole Discenza, The King’s English: Strategies of Translation in the Old English Boethius (New York: SUNY Press, 2005). Culturally significant divergences in the Old English Orosius include not only the geographical preface, which adds entire sections on the Northern geography related (purportedly) to King Alfred himself, but also certain extensions of mythological stories that would not have been familiar to Anglo-Saxon England. Godden, "The Anglo-Saxons and the Goths: Rewriting the Sack of Rome," Anglo-Saxon England 31 (2002) 61. Roman Jakobson, “Some Linguistic Aspects of Translation,” Theories of Translation: An Anthology of Essays from Dryden to Derrida, ed. Schulte and Biguenet (Chicago: University of Chicago Press, 1992) 151. Hayden White, The Content of Form, 5. Martha Graham Blalock, The Vita Sancti Edwardi Regis et Confessoris and the Vernacular Lives of Edward the Confessor (unpublished dissertation), 108. Once each semester, I like to take stock of what it is I will need to have accomplished by its close. This coming term will see the completion (I hope) of the first chapter of my dissertation, but that's by no means all I will be working on as the weather warms and summer comes again. I sat down this evening to make my forecast for Spring 2008, as it were -- updating my electronic calendar (so useful), figuring out my commitments, and settling in to make the most of the second half of my fourth year of graduate school. Top of my list of things I'm thankful for: NO MORE CLASSES. I do plan to sit in on a class one of my advisers is teaching on Epic, but that's more for my own edification -- I should really know Homer better than I do, and there are far less enjoyable ways to spend a few hours a week than reading epic poetry. [Re-reading post after the fact:] It occurs to me that there's no way I'll manage all of that by the end of the semester. But so long as I put a rather easy February to exceedingly good use, I should be able to avoid the worst of the academic March Madness, though it's a safe bet I won't be watching any basketball this season. Goal 1: Streamline use of Blog as model for academic conversation. Introduce earlier in semester (perhaps). Reading everything Bruno Latour ever wrote. Testing proficiency in Old Norse as second PhD language. February 16: ASSC conference at Yale. March 13/14: CELCE Conference on Borders, at NYU. Paper Status: Currently 21 pages (seminar length) -- to be cut. I'm on the organizing committee. I'm chairing the roundtable session on Academic Translation. Paper title: Can't remember at present. Paper Status: Will revise CELCE paper. Possibly add more theory. More Beowulf for the Holidays! From a lovely little perch in Reagan National Airport,* where the gathering gloom is delaying flights out of historic Washington DC right and left, I bring you glad tidings of great joy! ** Not only can you enjoy Beowulf the video game for X-Box 360 (what ever happened to "Super Nintendo"?) 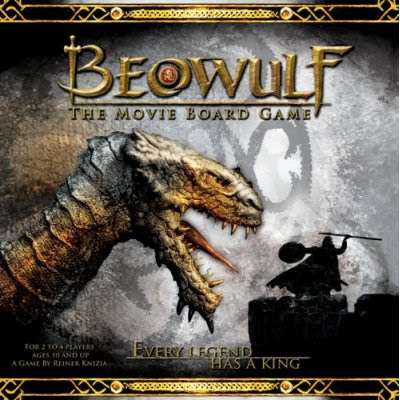 and Beowulf the Board Game (as reviewed by King Alfred at Bitter Scroll), but now we have this addition to our Beowulf themed gaming options: Beowulf THE MOVIE Board Game. [E]ach player strives to tell the most epic version of the Beowulf saga. To this end, each player takes control of Beowulf himself, guiding the hero and his companions to recount the chronicle in the most exciting way possible. Ah yes. This holiday season, you can test your story-telling skills against your friends and loved ones, and for once -- perhaps disappointing those of us who took the time to learn Siever's half-line types in the hopes of a future career as a scop*** -- meter doesn't count. Thanks to commenter LJS for the links! * By which I mean sitting on the linoleum floor outside my gate at the only free electrical outlet I could find in this wing of the building. ** By which I mean small rays of sunshine that briefly allay the tedium of 7 hours of delays. Side note: What on earth did people do before WiFi? ***Am I the only Anglo-Saxonist who has considered this as an alternate career path if the academic job market doesn't work out? Also: Are there hirings for scops these days? ****By which I mean I don't consider myself entirely responsible for my poor board game choices when seeking to avoid boredom when attending seminars in West Virginia. As everyone who is on the ASSC listserve now knows, as of this week we've finalized our schedule for Spring 2008! Our fourth year, in keeping with the ASSC tradition, has featured some wonderful speakers from a variety of different academic backgrounds already, and the spring schedule looks to be one of the best yet. We're holding our fourth annual grad conference (put together by the graduate students in Old English at Yale), and the second Anglo-Saxon Futures conference, which I have mentioned a couple of times on this blog. Add that to a line-up of speakers including Andy Orchard, David Johnson, David Damrosch and NYU's Hal Momma, and it should be a really exciting Spring for Anglo-Saxonists in the New York area and beyond! Click on the "Read More" below to see the full schedule, or check it out at our website, where we keep listings of all of our events for your perusal. And as always, if you would like to be added to the ASSC listserve, please send me an email at assc@columbia.edu. “Forensic Philology and the Interventions of the Tremulous Hand of Worcester"
"A Rune of One's Own: Negotiating Latinity in Medieval Iceland and Colonial New Spain"
"Anglo-Saxon Futures II: About Time"
The ASSC is sponsored by: The Department of English and Comparative Literature, Columbia University; The Office of the Dean for the Humanities, FAS, New York University; The Department of English, Princeton University; The Medieval Studies Program, Princeton University; The Department of English, Rutgers University. Many events and conferences are kindly sponsored by other host institutions and related departments or programs, to be specified in individual announcements. or, "Old English isn't dead, it just retired to Holland!" For many years we Old English scholars have asked ourselves the deep questions. Why does modern English sound the way it does? What rules governed the the umlauting of strong verbs of the fourth conjugation? Did the monopthongization of dipthongs occur earlier or later than the loss of the proto-Germanic endings in -jo stem verbs? * More importantly, if Old English is really a dead language, who killed it? I noticed, a few weeks ago, an email to Ansaxnet from Larry Swain (who also blogs at The Ruminate and, in another medievalist group blog, Modern Medieval) featured the answer to at least one of those questions. And as I've not seen it anywhere else in the medieval blogworld, I thought I'd post it here (apologies if I'm just repeating what's already been spread far and wide). Behold: On the Discovery Channel (UK), Eddie Izzard went to modern Holland to buy a cow. In old English. And he did. *it is important to note that I do not have my copy of Alistair Campbell anywhere nearby. My grasp of Germanic philology being fuzzy at best, I've more or less invented these questions for Anglo-Saxonists. I do know, however, that all of the items mentioned do exist. As one of my favorite professors once said, "you can't make this stuff up." This past week, in the midst of sifting through the fifty times "says Orosius" occurs in the Old English translation of the History against the Pagans, I reached another milestone in my academic life. As I've mentioned elsewhere (follow the link for the abstract! ), I was asked back to my alma mater, Wake Forest, to give a talk to their medieval group. It was my first real "academic" talk. The presentation went well -- and I was pleased that it was made among professors and friends who are as dear to me as those at Wake. I got some very productive questions: most notably, and perhaps most interestingly for the dissertation prospectus this talk is going to morph into over the next few days (a transformation I began last week before the talk) was a question about resistance to the use of not only multiple theoretical perspectives but of their use in understanding, speaking of and writing about Old English literature. It's a question I'm still working out the answer to. At any rate, I've posted the first part of my talk below for your reading enjoyment. Questions, comments and criticism are all welcome (and frankly needed!). I'll be posting the rest of it over the course of the week, while I wrestle with the Old English Orosius and the temporalities of translation for a paper due next Monday. For now, however, I give you The Horizons of History -- or perhaps what ought to be called "Notes Towards a Dissertation." Apologies for randomness of my citational style -- occupational hazard of the oral format I fear. how noble princes showed great courage! pay him tribute. He was a good king! Familiar though they are, for an Anglo-Saxonist the opening lines of Beowulf return like a cherished refrain, calling out across time to form and reform a community of listeners around a well-known text. Indeed, we have heard this story before – in multiple classes where we teach, read, or translate it. And each time it is translated or reworked, we return to a scene of a “telling” – the scene of a tale which is resurrected across historical and linguistic difference, to speak to us in the now. However, these familiar lines are also the space in which more than one community – or as I will term it collectivity – is formed through the narrative. My use of “collectivity” rather than community bears some explanation: partially informed by the work of Bruno Latour, the term “collectivity” avoids the artificial, vertical distinctions most often drawn between “nature” and “society”, subjects and objects, humans and non-humans. 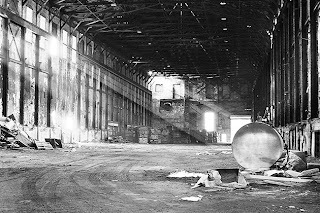 I would suggest, rather, that by allowing all of these (artificially constructed) sets – humans, non-humans, nations, texts, myths – to operate as quasi-objects or actors in what Deleuze and Guattari term the plane of consistency, we might allow for a more dynamic understanding of how ideas, humans, texts, and social groupings interact and operate on equal grounding in the construction of group identities. Returning to the opening lines Beowulf, then, we begin to see these collectivities taking shape from the very beginning. In the space of less than a dozen lines, the poem identifies at least five separate collectivities which inhabit multiple temporal spaces interlaced not only in this opening but throughout the work. We have the ‏Gar-Dena, those þeod-cyninga, the kings of the people, who form the first. They are a collectivity perceived – or received – by a second, listening group, indicated by the “we” of the first line. Scyld Scefing himself calls the third group into being: because he egsode eorlas, terrified the earls, we now have a collectivity best described as “those who are terrified by Scyld.” The final lines offer two more collectivities, one of which is predicated on Scyld’s actions, and one in which he participates. Scyld Scefing unites those who lie as ymbsittendra (the sitters-about, as it were) or bordering nations, all of whom unite to gomban gyldan – to pay him tribute. Scyld, we are told, wæs god cyning (was a good king). Of the set of good kings, he forms a part. These collectivities co-habit the first eleven lines of Beowulf – yet they do not exist in a single, identifiable time in history. They inhabit multiple temporalities in the single space of the text. The implications of this for the formation of collectivities (which, remember, can include texts and humans) is most marked with the case of the “we” with whom the poet begins. The word seems to mean, or refer to at least – us: the listeners, the readers, the group which receives stories and texts passed down from geardagum. However, when examined closely, it becomes clear that this is a “we” of whom we can know very little – always shifting, it is reconstituted in and by each poetic utterance. Beowulf, though we read it as a written text, is of course, part of an oral tradition. What is identifiable about this particular collectivity, then, is the action, and not only that of listening. The active identity of the “we” in the first line of Beowulf describes a community via a completed action, and not simply that usual translation of gefrunon, “have heard.” Gefrunon, from the infinitive gefrinan, carries the connotation of a very specific way of gaining knowledge: used only seven times in the corpus, three of which occur in Beowulf, the majority of the uses of the verb involve a sense of what Bosworth-Toller defines as “to learn by action, find out.” Perhaps the most intriguing of these uses occurs in line 76 of The Dream of the Rood: Hwæðre me þær dryhtnes þegnas, freondas gefrunon, gyredon me golde ond seolfre (“Yet the thanes of the lord, the friends found me there, and geared me with gold and silver,” 75-77). Bringing this meaning to gefrunon’s usage in Beowulf has a crucial effect: bound together by what we might even term a quest, “we” have heard of these other collectivities which inhere in the poem not simply because we read it, or stumbled upon the knowledge. “We” learn by asking – we find out, we discover. The poem, then, anticipates our response to the history it represents. It acknowledges a futurity of reception – a time when another “we” will have learned by asking. This “we” – a collectivity already written into the fabric of the poem – constitutes a kind of futurity within Beowulf that posits a world beyond its composition and recitation – a world that will actively engage it in a time which is, for the poem, fundamentally not yet. As these opening lines of Beowulf suggest, the “time” of the poem embraces a variety of temporalities – from the time of its main actions, to the distant past of Scyld, to the eternal time of Christian cosmology. The significance in the futurity of a “we” who learn by asking, however, is of the utmost importance in beginning to understand the multi-valent temporalities of the collectivity in Anglo-Saxon and medieval literature. In his “Discourse and the Novel,” Mikhail Bakhtin posits the intentionality of living discourse as a space shot-through with the multi-temporal status of utterance – a space, perhaps, not unlike the space of Beowulf. For Bakhtin, the “internal dialogism” of the word “is directly, blatantly, oriented toward a future answer-word: it provokes an answer, anticipates it and structures itself in the answer’s direction. Forming itself in an atmosphere of the already spoken, the word is at the same time determined by that which has not yet been said but which is needed and in fact anticipated by the answering word. Such is the situation in any living dialogue.” (280) Bakhtin, of course, is speaking in direct relationship to the novel – a form foreign to Anglo-Saxon England. However, I would argue that Anglo-Saxon literature – be it prose or poetry, translation or creation – might be fruitfully thought of as constituting itself a living discourse, a space in which ideas of collectivity, time, and identity are begun, and reworked, through the period and beyond it. The subject of my talk today – and of my dissertation, coming to a database near you in 2010 – is what I call the horizons of history. With the plethora of theoretical and critical terminology at my disposal, from fields as divergent as literary studies, historical studies, linguistics and art, one might well ask why I speak of Horizons rather than perspectives or boundaries. The answer is far from simple, but a brief explanation might serve us well as a beginning. Horizons can only be observed in the middle – i.e., the horizon is always experientially equidistant on all sides from the center point, that of the observer or subject. Any movement of the subject recenters the span of the horizon – new things come into the line of vision, others drift below the perceivable boundaries of sight. Consequently, a horizon cannot be crossed by the subject who observes it, whether they look “forward” to a future or “back” to a past. Only the object can cross over the horizon. The nature of horizons, then, is as a limiting factor in perception, defining the scope of the subject’s world-view. The question this raises in my work is in the definition of boundaries. Boundaries must enclose something, be it a people, a place, or a time. In my argument, the boundaries in question enclose a larger, and even more contentious concept – that of “history.” For my purpose, I wish to engage the narrative strategies of history in what is traditionally called the Anglo-Saxon period. For my purposes, I define “history” – and “historiography” -- as the narrative space in which collectivities imagine and create their identities—or have these identities imagined and created for them. As such, my interest in history is the way in which historiography itself can be written in order to become that object which crosses the temporal horizons which bind its own world-view. Intersecting Bakhtin’s definitions of “living discourse,” these texts participate in a temporality that supercedes and encloses the individual times which compose the heterogeneous temporal fabric of the text. As such, the discourses of past, “present”, and the future unwritten intersect, creating a temporal space in which ideas of collectivities inhere and are passed on. My dissertation explores a couple of different concepts of what “Anglo-Saxon” Collectivities can mean through the early Middle Ages and beyond. Unbound from periodicity in the strictest sense, the “Anglo-Saxon”, or “Old English”, becomes a constructed category, created and deployed in different historical moments for different purposes. Most specifically, the collectivities imagined in the Anglo-Saxon period are re-imagined at specific moments by communities in the process of imagining themselves, effecting what I will argue as a kind of collapsing of temporality, bringing together humans and texts that are temporally distant into a single collectivity. This “Becoming Old English” changes the ways in which the idea of a “nation” inheres in time, positing the time of the text as a time which allows for the breakdown of temporal boundaries, writing futures and pasts for a present which needs them. The time of the text is, irrevocably perhaps, always now – a contingent, relational now which participates in the past and future which permeate its horizons. Bakhtin, Mikhail. "Discourse in the Novel" in The Dialogic Imagination. Texas: University of Texas Press, 1982. Deleuze, Gilles and Felix Guattari. A Thousand Plateaus. Minneapolis: University of Minnesota Press, 1987. Joy, Eileen and Mary K. Ramsey. "Liquid Beowulf" from The Postmodern Beowulf. Morganton: West Virginia University Press, 2007. Latour, Bruno. We Have Never Been Modern. Cambridge: Harvard University Press, 2007. Also: I'm not sure how to cite this yet (though I will find out): the work posted here on ITM by Karl, Eileen and Jeffrey (along with many of the comment-ers) has had a foundational role in my thinking, as is no doubt obvious down to the very level of vocabulary. If there's a horizon that's been expanded in the work I've done toward this talk (and the prospectus which shall follow), it is most definitely the one that forms the boundaries of my own academic and intellectual capacities. For that: thank you. Cross posted at In the Middle. What do you get the Anglo-Saxonist who has everything? Why, the one thing that they probably won't find at the MLA this year (prospects for a job). 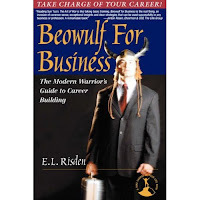 E.L. Risden's Beowulf for Business piques my interest, and with the syncretic winter holiday season approaching, I think this should make a fascinating read. It also proves that Beowulf has implications for modern life in ways of which I might never have thought. My guess at a top rule: Never fight a dragon yourself. Get a lackey...I mean HERO...to do it for you. Thank you Ansaxnet for the link. More accurately: Columbia Medieval Happenings. Tomorrow afternoon Caroline Walker Bynum will be having a "medieval conversation" with my adviser. I'm going to be giving my own talk at my alma mater in North Carolina...otherwise, there's no doubt where I'd be. But more on that later. For now, expand this post to get the full info on what promises to be a fascinating talk between Caroline Walker Bynum and Patricia Dailey. Where Patricia Dailey will be speaking with Caroline Walker-Bynum about her most recent book Wonderful Blood and issues addressed in her many other books. It will take place in 754 Schermerhorn Extension (IRWaG seminar room) - entrance through Schermerhorn then to the right, through the hallway, up the elevators to the 7th floor. Cross-posted at In the Middle. All this raises a question, dear readers: Where will you be on November 16th? Grendel's mom wants to know. I'm not allowed to blog until I've finished grading my students' papers (computer's been giving me fits) -- HOWEVER. I saw a recent hit on my blog that was for "best universities to study Old English". I won't say anything on the blog about my opinions on this (they are many and diverse, o readers, and you won't come out even really knowing what I think!! )but I did want to say that if you really want to know my opinion of my own institution I would be glad to give you my opinions. You may reach me at [first initial][middle initial]DOT[last name]ATgmailDOTcom. What I can say: what we all know. If you're looking at universities that have a practicing Anglo-Saxonist (it's not a job, it's a way of life) -- you will be in for a treat. Regardless of where. Anglo-Saxonists (and medievalists more generally) are almost always what I would call "good people". And fantastic scholars. I like my field, have I mentioned that? Edit, after a query: So what on earth was I posting about here? Well, mostly just that some poor soul lost on the internet thought they'd find an opinion about old english programs written on this blog. Of course, I don't do useful things like that. So I thought I'd offer my poor overworked brain to those young, unjaded grad-school hopefuls who want to know something about Old English studies. Of course, given my inability to clone myself and study Old English in other universities (how SWEET would that be? ), I can only give my thoughts my current place of study. If I do manage to clone myself, I'll send out contact info for my other selves, don't worry. The scene: 17th century Japan. Hiro, a young man from the 21st century, has accidentally landed here after attempting to employ a superpower he has recently developed. Hiro can stop time. Apparently he can also time-travel. In last week's episode of Heroes (a show just entering its second season on NBC), Hiro's found a way to write notes in the 17th century that will survive into the 20th and be found by his friend Ando, kept safe inside the hilt of a sword used by the legendary Takezo Kensei. Takezo Kensei has been Hiro's idol since childhood, when his father told him stories of the great warrior. Arriving in the 17th century, Hiro finds that Kensei is not only a drunkard and a middling warrior at best -- but he's not even Japanese. He's English, a traveler. And yet he's supposed to be one of the greatest fighters of all time. "Righting History and turning Takezo Kensei into a hero will not be easy. But at least I'm not alone. Ando, I've met the most beautiful woman Japan has ever seen, and I think I've fallen in love with her. The only problem? History has already written that story, and she is destined to be the great love of Takezo Kensei...It was clear Kensei wouldn't become a hero unless I forced him to learn the hard way. If he could defeat the ninty Angry Ronin, he'd have a chance at becoming a hero." Hiro does Kensei the favor of dropping him off with the ninety Angry Ronin, and leaving him there to either "become" a hero or die. Of course, Kensei has a superpower too -- he can recover from any wound. He is, however, unwilling to use his superpower "wisely" -- i.e., for the good, or the good as Hiro sees it. Part of helping Kensei "fulfill" his destiny means that Hiro must give up a woman he believes he's in love with. The victory over the Ronin solidifies Kensei's place in the Princess' affections. Later in the episode, Hiro is ready to leave: Kensei asks him how he's supposed to become the warrior he's "destined" to be if Hiro isn't with him. My point in summarizing this lengthy series of scenes from last week's episode is that it bears certain, if tenuous, relations with what I'm hoping to write about as I continue my dissertation prospectus. Thinking through the idea of history necessarily means asking questions about narrative: that much is obvious. Heroes, however, is coming at it from another angle. Hiro seems to be playing a role that's difficult to imagine. Hiro's influence in the past -- pointing Takezo Kensei toward his "destiny", hoping to restore a timeline somehow made different by his presence there. Hiro remarks on the way in which "History" writes stories -- and has in fact already written the one he's in -- yet his work in the past (if you can call it that) creates the very stories he's claiming as a kind of inherited tradition. I guess what's fascinating here is the way in which Hiro's position is that of the disembodied "History" he speaks of when he remarks that "History has already written that story." Of course, as viewers (co-conspirators?) we know that Hiro is only partially correct. History hasn't written the story -- or more precisely, hasn't written it yet. What's intriguing is that History -- in the form of Hiro -- has already heard the story - and knew it, in fact, in advance of arriving on the scene as an historical agent. 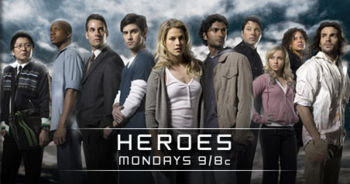 Heroes, I think, takes an interesting position vis a vis history and the role the subject can play in it (whether or not the writers are aware of it, though I'd like to think they know exactly what they're doing). History arrives from the future (literally in this case) and inscribes a narrative, a trajectory, where before were inert forces, empty lives and silent stones. JJC writes here that in encountering Barber rock at Avebury, My son and I touched a megalith’s cold side and felt our own desires. Hiro's dilemma in this episode of Heroes is that he knows history must be written as he has already heard it -- yet his desire is that it be written differently, perhaps even Otherwise. I'm mixing a variety of thoughts in this post, which is the product of a long drive on the Blue Ridge Parkway earlier today. However, I think it's a productive mix: Caught between the stories he knows and the feelings he's developed for the Princess who is meant to love Kensei, Hiro's role as agent of History (or History incarnate) becomes mixed: his loyalties divided, he's caught between the past as he Knows it and the future he wants for himself. I wonder if there's a way of thinking through this odd relationship between Hiro, Heroes and the past that could be a productive exercise towards examining the writing of other historiographies. What happens when we bring our own subjectivity to the past? Can we ever escape the desire to see the world not as it is but as we've learned to narrate it, whether we encounter that world in a text we find in the archives or in 17th century Japan as a result of time-travel? My own answer is no, not entirely -- but then, I've never found myself, as Hiro does, writing a history that would be passed down not to others but to Me. I suppose that History has always written our stories -- both in the sense that our stories are structured by an inherited tradition and by single humans' experiences of those times. The question is whether we can work to find the human agency that wrote that history, and the tensions that suggest there might have been a way of narrating it Otherwise. As of Monday, the CFP is officially out for the fourth annual ASSC graduate student conference. This year, ASSC is "on the road" -- the conference is to take place in New Haven Connecticut, and will be hosted by the intrepid Anglo-Saxon grad students there. The topic? "Pleasure in Anglo-Saxon England" -- the conference is to take place the 16th of February, with abstracts due November 26th. Looks like it will be a fantastic event. Last year, two of the organizers presented at the conference here at Columbia -- both had fascinating papers. From the grad student side, I know our interactions with our Yale colleagues are always intellectually productive -- not to mention just downright fun. Click "read more" to expand the post for the CFP (as it was sent to the ASSC listserv yesterday). Visit the ASSC website for further details, and other events. Yale University, in partnership with the Anglo-Saxon Studies Colloquium (Columbia, Rutgers, Princeton, NYU), invites submissions for the fourth annual graduate student conference sponsored by the Colloquium. The theme of this year’s conference is “Pleasure in Anglo-Saxon England.” We invite submissions addressing any and all manifestations of pleasure in Old English or Anglo-Latin texts, Anglo-Saxon history, art, religion, or archaeology. We welcome a variety of methodologies, being equally pleased by the philological delight of a word study as by a wide-ranging treatment of emotions in Anglo-Saxon society. We also invite papers on the particular pleasures that the Anglo-Saxon world offers post-medieval scholars, artists, and armchair antiquarians. In the tradition of the Colloquium, we will be having respondents for the paper presentations, which should be no longer than ten minutes. Conference organizers: Irina Dumitrescu, Denis Ferhatovic, Jordan Zweck. I was browsing the New York Times online this evening and stumbled across an article I found interesting, which for once intersects in very specific ways with my own interests. Some languages vanish in an instant, at the death of the sole surviving speaker. Others are lost gradually in bilingual cultures, as indigenous tongues are overwhelmed by the dominant language at school, in the marketplace and on television. New research, reported yesterday, has found the five regions where languages are disappearing most rapidly: northern Australia, central South America, North America’s upper Pacific coastal zone, eastern Siberia, and Oklahoma and the southwestern United States. All have indigenous people speaking diverse languages, in falling numbers. In a teleconference with reporters yesterday, K. David Harrison, an associate professor of linguistics at Swarthmore, said that more than half the languages had no written form and were “vulnerable to loss and being forgotten.” Their loss leaves no dictionary, no text, no record of the accumulated knowledge and history of a vanished culture. It seems like a part of what's at stake in the article isn't simply the languages that are threatened; rather, there's a very specific, human cost in their loss. I'm inclined to think that there's a degree to which this shares some focus with other recent posts and comment threads here. The idea of a "deep past" that precedes written history is transformed in this article about languages, leaving open the possibility that there is, increasingly, access to entire histories and peoples lost with the passing of the spoken languages that preserved them. In a talk with friend (and sometime commenter on this blog) LJS this afternoon over coffee, the subject turned to translation. I've been studying, and attempting to produce, literary translations of Old English poetry over the past year -- a side-effect of participating in two translation workshops, as well as the presence of the new Center for Literary Translation here. I've come to explain my difficulties with literary translation as a problem with poetics: I can be a very good writer, but only of a specific genre (literary criticism). I will, in short, never be a poet. LJS's response was interesting. He discounted genre as a factor -- rather, he explained my problems with translation as a function of loving language. More precisely, a function of loving Old English more than I'll ever be able to love modern English. I'd never really thought the problem through in those terms, but it makes some sense. I nearly always go for the too-close-to-the-original in my translations. I think it's because I'm worried what my inability to be truly faithful to the original language I'll lose something vital. Or worse yet -- something still living in the dead language. Another measure of the threat to many relatively unknown languages, Dr. Harrison said, is that 83 languages with “global” influence are spoken and written by 80 percent of the world population. Most of the others face extinction at a rate, the researchers said, that exceeds that of birds, mammals, fish and plants. I spend a lot of time with dead languages. In fact, I probably spend too much time with them, given that I prefer to think of them as languages not currently in use. Thinking about my difficulty with translation and Old English, I can't help but wonder if my ambivalence with translation of late is a part of the larger problem: I don't know if the necessity of translation helps or hurts these dying languages, particularly when there is no way to keep them from being pushed out of linguistic currency by the 83 global languages. In some sense, I think I'm feeling the sadness of losing access to the worlds these languages point to -- the histories that will never be told, the stories that won't be passed down. The worlds that will be left behind, forgotten, because the voices that could speak them fell silent. Preserving the languages is important, and these linguists are performing a service to future study, but how much can they really preserve? I can't help wondering -- with no hope of even a (silent) fossilized remnant to be interpreted (correctly or incorrectly) afterwards, what happens to stories that aren't passed down? And when these languages die what happens to the worlds and peoples they -- however partially and fragmentedly -- represent? File that under questions I'm not sure how to even begin answering. Yes, it's time to update OEinNY to note my newest "change in status." The box on my little grad school to-do list next to "Pass Oral Exams" has been ticked off as of last Thursday. Now things can get back to a semblance of normalcy around here. For example: I can start filing all of the file folders I accumulated during this process. I may need a bigger filing cabinet. Please note the new Subtitle of the blog -- comments? Thoughts? Anything more poetic? We will now, of course, begin referring to you as "Master of Phil." Just exactly who Phil is, and how he's going to take this new role of servitude, I'm not sure. May you rule justly over him. Something more substantial tomorrow. For now, I'm just glad I already planned my nine AM class. Meaning: more time to be properly caffeinated before I show up to teach. I woke up this morning to sad news: Luciano Pavarotti has lost his battle with pancreatic cancer. It's strange -- in a lot of ways, I grew up with Pavarotti's music in the background. The Three Tenors concerts were something my whole family sat down to watch together -- more than once. I nearly got kicked out of my family when I said there were moments I like Jose Carreras' voice just a little more than Pavarotti's. Christmas music was always Pavarotti. I guess I know what I need to download for my orals "soundtrack," don't I. His Nessun Dorma was my first true love in terms of music from opera. I hadn't seen or listened to Pavarotti in a while as of this morning -- but on a day like today, I guess it makes sense that the songs that I listened to for so much of my childhood will be on my iPod today. 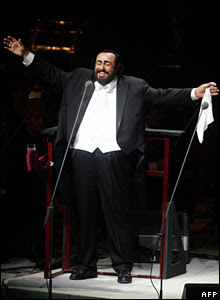 It's funny -- though clearly there's no personal connection with Pavarotti, the music forged its own kind of connection, to the point that at one time in my family, we spoke of "The Three Tenors" as though they were people we know -- as though they were our friends too. Silly -- but also says something about music, I think. Hoping to do a more orals-centric post before the test -- but we'll see. For now, off to teach.